I admit that I have a knack of combining my favourite food into one dish. This is clearly the greediness in me of trying to make food taste even better. 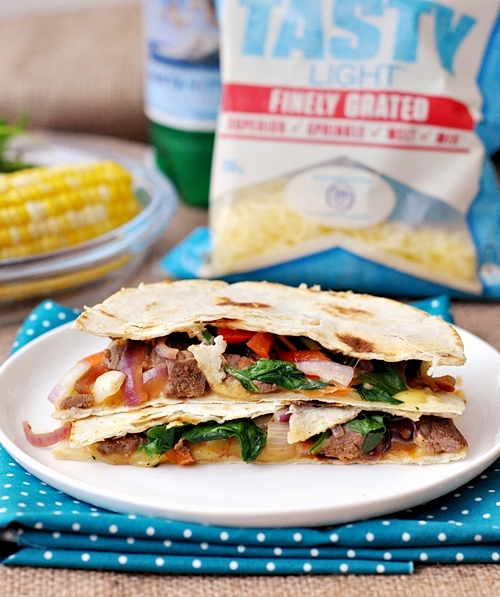 In case you are wondering what is this clumsy looking quesadillas all about, well, it is a a product of my greediness of combining my favourite beef fajitas, melted cheese, fresh onions, spinach and rocket (arugula) leaves sandwiched between my homemade flour tortillas. Doesn’t this sound amazing? Okay, I’m not trying to blow my own trumpet here but I don’t think anything could taste bad when melted cheese is involved, no? Let’s not forget homemade tortillas! Somehow the idea of homemade makes everything tastes better, just like slapping the word “organic” on the fine dining menu. (1) Heat a small greased pan over medium heat. 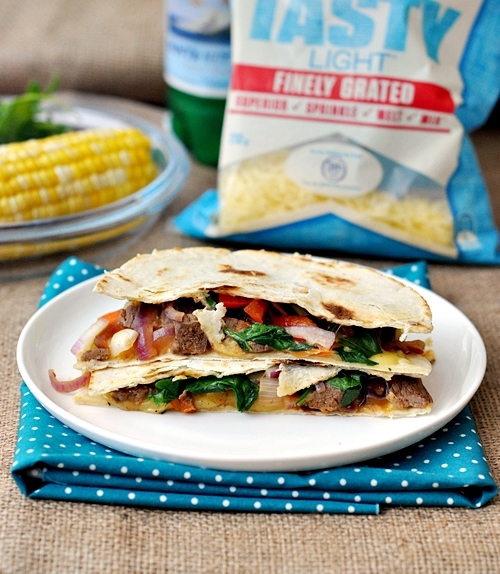 (2) Assemble the quesadilla. 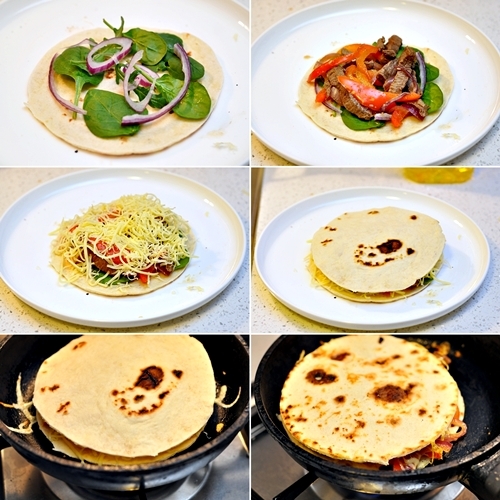 In this order, start with the first tortilla on a flat plate, then salad leaves, onions, beef fajitas and shredded cheese. Then top with the second tortilla. (3) Use a spatula to transfer the tortilla to the greased hot pan. Cook until the bottom section (pan side down) is well heated and use the spatula to flatten the quesadilla a little in the meantime. 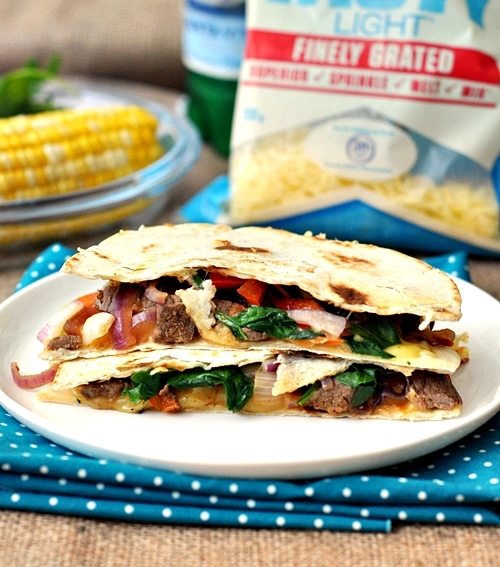 Then use the spatula to flip the quesadilla to heat the under side until the cheese is melted. (4) Transfer to a plate, use a sharp knife to slice it in half and serve immediately. A hint for you. I’ve found that quesadillas stick together better if you put 2 layers of cheese – one layer under the filling and another on top of the filling.